BetAt Casino is a live casino belonging to NRR Entertainment Limited. Launched in 2011 with a licence from the Maltese Gaming Authority, the casino offers a broad range of games including classic casino games, a live dealer section, scratch cards and the possibility to engage in online sports betting. BetAt Casino’s selection of games is large and diverse. With over 250 titles it caters to almost all types of players. Fans of video and 3D slot machines are well served by the developer Microgaming whose Viper software is the basis for BetAt Casino’s platform. One can play fascinating games again like HellBoy, Hitman, Supernova and Dark Knight Rises and also the recently released Game of Thrones slot based on the TV series. Other developers such as NetEnt, Leander Games and NextGen provide the casino with several one arm bandit and video poker titles and classic table games. In total we have listed thirty table games, more than 220 slot machines and fifteen variations of video poker and also a dozen jackpot games. BetAt Casino also offers speciality games (keno, bingo, Sudoku etc) as well as sports betting. Do you want to experience the atmosphere of a real casino and play with real dealers? BetAt Casino has thought of everything and offers its players a live section with real, experienced dealers. So you don’t need to dress up anymore to go out. From the comfort of your own living room, wearing your slippers, enter the world of live gaming and have a very enjoyable experience. In this extremely realistic live casino section powered by Microgaming you can join exciting games of baccarat, roulette or blackjack. You can decide whether you want to play alone with the dealer or with other virtual players. In either case you have the possibility to chat live with the female dealer or any other players at your table. For those who have always dreamed of playing in an exceptional setting, the tables hosted by Playmates guarantee a really unique gaming experience. BetAt Casino offers all players signing up on its platform a welcome bonus spread over the first two deposits. For each of these you can a 100% supplement on the deposit up to €150 with a bonus of 50 free spins to use on two of the casino’s slot machines, Starburst and Twin Spin. 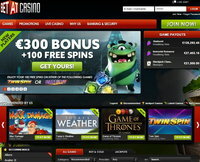 So, one could get a total of €300 + 100 free spins as a welcome bonus on BetAt Casino. However the wagering required before any withdrawal makes these two bonuses much less attractive than they appear. For each of them it is 30x the amount of the bonus + the amount deposited. So it may be better not to take it. It’s similar for BetAt Casino’s weekly bonus. For every deposit of at least €50 on Tuesdays, Wednesdays or Thursdays, the casino offers a bonus of 50 free spins on Fridays but in this case also the betting regulations often make the offer not worthwhile. BetAt Casino offers several payment solutions: bank draft, cheques, Visa card and electronic wallets like Neteller, Skrill, Ecoaccount and WebMoney. Deposits can also be made with Ukash, Paysafecard and Mastercard. BetAt Casino’s customer service can be contacted by telephone, live chat or by completing the online contact form available on the site. The response time is relatively short. – The Microgaming live casino which lives up to its reputation. – The rapid pay out times especially with the electronic wallets.